I love taking my dad out for a great meal, just me and him. He’s constantly on the hunt for the next hidden gem he can impress his friends with – I guess he thinks himself a bit of a foodie in that sense – and why not I say? 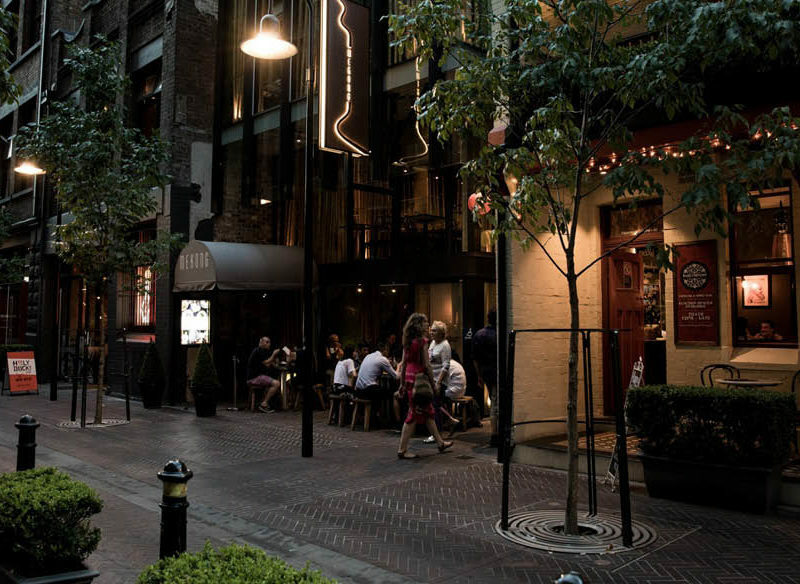 The street itself is picturesque – especially at night. Quaint restaurant fronts line the walkway, with a lantern-lit thoroughfare and the smell of incredible culinary offerings on both the left and right. It’s the kind of street that can satisfy even the hungriest of bellies with just a sniff. 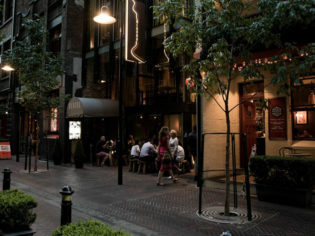 With a terrace-style front and only a handful of tables outside, you’d be forgiven for missing Gin Lane entirely, but don’t be fooled, this is one of the best spots for people-watching on the strip. It didn’t take long for our cocktails to arrive; a Mediterranean gin and tonic with rosemary and olives for Pops and a ‘Blue Magic’ gin and tonic for me – complete with lavender syrup and Indonesian spices. Unreal. Mediterranean gin and tonic with rosemary and olives from Gin Lane. Dad’s was the real prize though, especially when the waiter came outside and lit the rosemary in his drink on fire. A drink and a show indeed. That herb was smoking, releasing its sweet scent to the street for at least five minutes after. But I doubt anyone minded, it was seriously cool to watch – and inhale. The house olives were second to none, it must also be said. Set a floor above the street, the moody lighting and the aroma of the nearby kitchen had us excited to order as soon as we found our seats at Eastside Kitchen. First up was Sydney rock oysters with ponzu jelly and tobiko. Wow. Teamed with the king trout carpaccio, well – that was half of the raw menu swimming around in our grateful bellies. Not to be satisfied too quickly, we snapped up the ceviche of prawns, swordfish and trout with gusto – it was seriously scrumptious. We finished off the meal with something from the hot menu; the Angus striploin steak. Shared between us, we savoured every mouthful of the tender meat – and teamed with the smooth Gewürztraminer we ordered, it seemed like a match made in heaven. If Willy Wonka opened a dessert shop, it’d probably look a lot like KOI. Dining out on the non-traditional and Instagram-friendly dessert trend, KOI nail something that so many others miss: taste. Not only are the desserts incredible to look at, intricate in every detail and quite literally almost too good to eat, they also taste amazing. The mango yuzu looks exactly like a shiny green apple wrapped in chocolate, but the dip of the spoon reveals the most incredible mango mousse. ‘Nomtella’ by KOI Desserts. Made with espresso mousse, salted caramel, chocolate brownie and hazelnut. Another shout out must go to the Nomtella. Shiny and flecked with gold on top, but rough and raw down below, it’s made with espresso mousse, salted caramel, chocolate brownie and hazelnut. I mean, what more is there? Is this Australia’s most over-the-top high tea?